DiZ walks down the hallways of the mansain but stops haltinng Relix as well. "We have a visitor." Relix looks at DiZ. "How do you know? ", Relix closes his eyes and says. "That scent stinks!" "It's reeks of dark energy! Who is that?! ", Relix suddenly seems suprised. "I know that darkness!...but from where?" "It's ok Relix. Let whoever it is observe. If it's an ally the more the marriar, if it is organization member...Xemnas has a messenger. Saves you and Riku the trouble." Daimos quietly watches them from the shadows. Just then, Relix turns and a feeling of recognition passes over Daimos. "I...I know him from somewhere...but I'm not sure where exactly...maybe if I follow them farther I will learn more." He whispers and continues to follow them through the basement of the strange mansion. "To get there is not easy. I'll have to alter some world and match the locations of the keyblade graveyard. If successful, you and Relix would be able to get there with out fail. ", he looks out the window of a room. 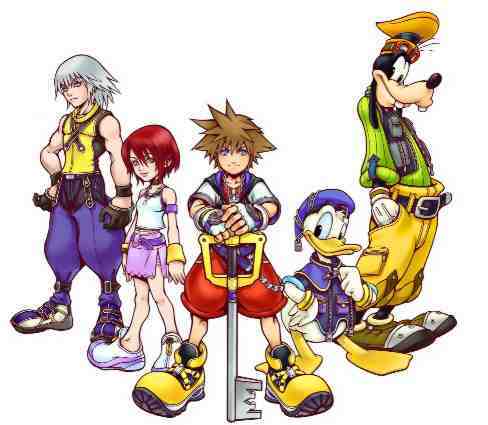 "If we plan to destroy the organization...we must have acsess to any keyblade we with. We will bring the chaos of the keyblade war and the victorious result as well." He walks down a flight of stairs. "You boys have somethings to take care of before you go to the graveyard. I want you to gather as many data as possible on the keyblade. Since you both are keyblade wielders that should be easy. ", DiZ then looks around the room as if watching a bird fly in and around the room. Still looking at the cieling, "We don't want..anyoneelse getting invovled. Search around disney castle. the King might have some documents on the keylade. Then you can scout Radien-...Hollow BASTAIN...for more documents. If you run into trouble...no witineses...make sure." "We have to find the weakness of each of the organization members and find the exact keyblade that will help us use that weakness against them." "I know the weakness for Xemnas.........It's the Oblivion-Oathkeeper combonation. He can't win when someone holds the keyblade...I will do it, now...access the graveyard so I can get Oblivion and Oathkeeper...We don't have time to gather Data Anse-I mean DiZ." Riku swung his Dark Abyss and said "WE HAVE TO HURRY!! "Keyblade graveyard...hmm...I think perhaps I will have to make myself known...in order to learn more..." Daimos whispers to himself. He emerges from the shadows to confront them. He looks around the room then focuses on DiZ and Relix. "What businees do you have in the keyblade graveyard?" Daimos demands. "Daimos!!" Riku exclaimed "Your here!! Will you help us to defeat the organization?" Axel keeps to the darkness thinking to himself"i hope that know that i don't agree with the plans that the Orinization has for Kingdom Hearts. "Then he coes out from the shadows to try to explain to them that he isn't REALLY with the orginization anymore. Riku listens to Axel's explination and sais ".......fine Axel you can help......I can tell you aren't lieing..."
Thank you Riku. "Axel then says hey to everyone else in the room. I am Sorry For The Bad Beginning," Roxas Says as he comes out of the Shadows," but if Axels in i am in,"
Daimos stands in thought then nods slightly. "Very well, if it means that I will find the answers I seek, then so be it." He agrees. "Ok then Now let's go!" Riku said. The Oblivion and Oathkeeper keyblades suddenly appeared in his hands. "Whoa.......This is better than I thought!!!" "Looks like we are going to have a big journey on our hands guys! Let's be sure we are completely ready before we leave ok?" Riku says as he walk toward a portal he just made. (OOC: the only way people can use portals is if I teach it to them when they get 100 posts ok???) now back to the RP story. IC: Riku walked toward the portal. "Is anyone else comming with me to The Altar of Naught in The World That Never Was?" He turned and walked into the portal. "Riku...not all of us can tag along...", Relix then remembers that feeling of no friends. "Maybe if....you.."
Daimos glances at Relix then looks back at Riku. "Hmm...it seems the Twin Blades have chosen you...as their wielder...Interesting...I have other business that I need to attend to...but I will join you at the Altar of Naught soon enough, farewell." Daimos agrees then vanishes into the shadows. "Riku wait how are we going to get there?Without the portal I mean. "axel then looks to the others"unless any of you know the way, because i don't." "It seems we have a problem.......the portal won't stay active.... looks like we are going to have to just wait..." Riku said while turning toward Axel. "So...what now?"